"Every once in a while in the middle of an ordinary life, love gives us a fairytale"
Take a peek at one of our stunning 2018 Shiningford weddings or discover more details in our brochure. 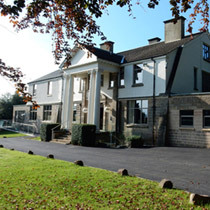 Ashbourne Self Catering specialise in the hire of luxury venues in Derbyshire. You have the freedom to create your own special weekend, choosing caterers, marquee, flowers etc. We can help with recommended suppliers, but you are welcome to pick what is best for you. A wedding coordinator is included as part of our wedding package, so that you can relax and enjoy the day. The fairytale venue of Shiningford is situated down a private tree-lined drive, just a stone's throw from Carsington Water. It offers complete privacy for your celebrations, in the most peaceful of surroundings. Shiningford is comprised of a large Manor House with 8 bedrooms & 6 bathrooms, The Tack Room with an additional 2 en-suite double bedrooms, and The Stables with 5 double bedrooms. The whole complex can sleep 34 guests. All the properties are fully equipped for self catering, furnished in a contemporary style, yet still reflecting the history of this Grade II listed venue. 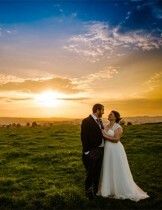 "We've just had our wedding here and what an incredible location! We had a pool party on the Sunday which was unbelievable and the accommodation was perfect for the occasion. Would recommend to anyone for absolutely any event"
"Most fantastic venue for our special celebrations. The whole family spent the weekend with us, couldn't have been better. Can’t believe its all over. Thank you Ashbourne Selfcatering for all your help." - 3 night weekend hire with exclusive use of the venue. - The choice of 3 areas to place a marquee for up to 250 guests. 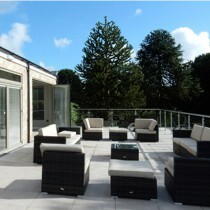 - Accommodation for up to 34 weekend guests residing in the self-catering accommodation. - Two large hot tubs available for the residing guests. - Large outdoor swimming pool for your resident guests. -Spacious gardens and orchard with children's play area. Hang the bunting, roll out the red carpet and sprinkle some magic! You can have your dream wedding and be inspired by our local suppliers to create your perfect day. Whether traditional or casual, Shiningford can provide the venue for you to add your little bit of magic to the special day. Choose you ideal caterer - street food, hog roast, ice cream van? Fairground theme, summer wedfest theme, fancy dress theme? There are no limits at Shiningford. Amongst the wildlife and flora, Shiningford is the perfect choice for a beautiful outdoor wedding. Shiningford is situated at the side of Carsington Water, 4 miles from Ashbourne. In the central location of Derbyshire, Shiningford is easily accessible for guests from all over. Exclusive but not elusive, Shiningford offers something different for everyone and the space for all of your guests to enjoy. Summer or winter, the venue provides a great backdrop for your event. 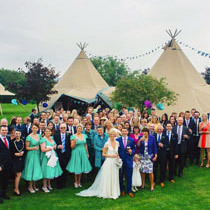 Standlow & Shiningford can accommodate a marquee, tipi or yurt. Choose between the picturesque village churches, local registry offices, or have a personal celebrant conduct your outdoor ceremony. Many of these companies can offer minibuses or small coaches to help with larger numbers. They should all be booked in advance. Memories may not be enough! The extra touches to make your wedding photos perfect! Need a few props for your big day?